"Aim to leave your hotel at about 10:00 and you can stop in at the ancient pottery village of Thanh Ha, which is on the road to My Son. Just 20,000 VND will get you in to roam around and a free clay animal. Thanh Ha is very much on the tour route, but weave in and out of the old houses and workshops and you�ll stumble across some surprising clay works � the Houses of Parliament and the Eiffel Tower reside there in scaled-down models. You may also get to sit at a wheel and potter your own piece of art. 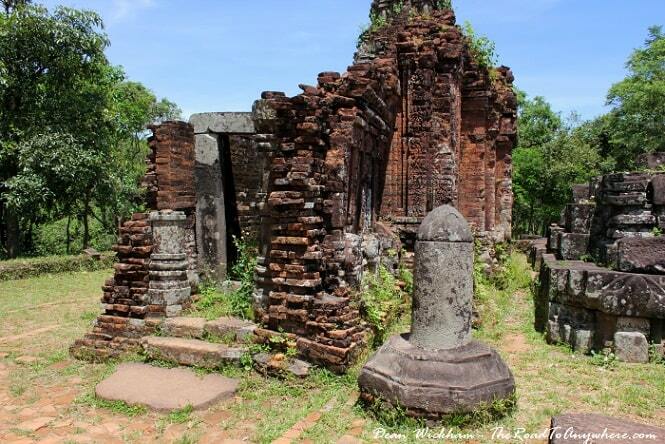 While you�re there, drop by the village pagoda, which is one of the oldest in Hoi An. It�s a very good example of one that has not been subjected to modernisation." My Son - is a collection of abandoned and partially ruined Hindu temples, built between the 4th and 14th century by the kings of the Champa. The temples are dedicated to worship of the god Shiva, the most important temple is the "Bhadresvara". 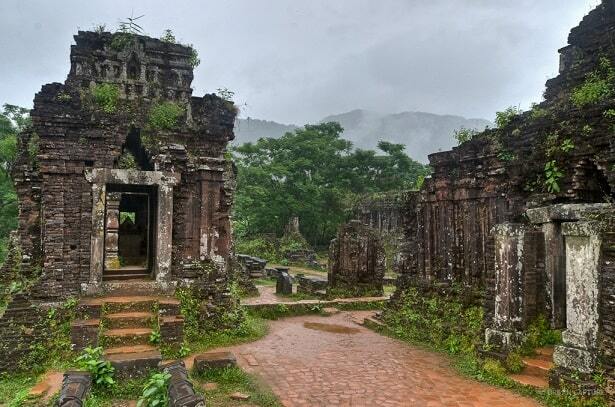 The temple complex is located one hour's drive from Hoi An and about two hours from Danang. From both places can a tour be made, but you can also arrange the tour by yourself. 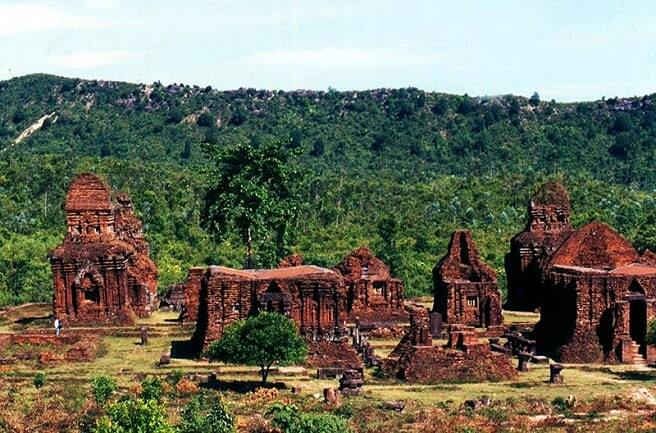 This cluster of temples can be visited between 06:30 and 16:30. In My Son you'll find the most extensive remains of the Cham period. It has an enchanting setting, because it is located in a lush jungle valley surrounded by mountains with the highest peak, called the Cat's Tooth Mountain (Hon Quap). The temples are in bad condition - only about 20 structure survived. Once there must have been at least 68 temples. But the intimate character of nature on this place, surrounded by gurgling streams, is still fascinating. My Son was once the most important intellectual and religious centre of the kingdom of Champa. Probably it also served as a burial place for the princes of the Cham. In the late 19th century it was rediscovered by the French, and they recovered parts of the complex. Nut later US bombing destroyed some temples. It was in those day, that My Som was a base for the Vietcong. Nowadays, the complex is since 1999 part of the UNESCO World Heritage Heritage List. Only a handful of these monuments have a description on plates, but the recent ongoing restoration gives good information, which describes the history of this place. It's very busy at the ruins in the daytime, so you'd better go early in the morning or late in the afternoon, if you have the opportunity. If you leave Hoi An at 05:00 to 06:00, you get to before sunrise. You have to leave, when the tourists groups arrive for the excursions. 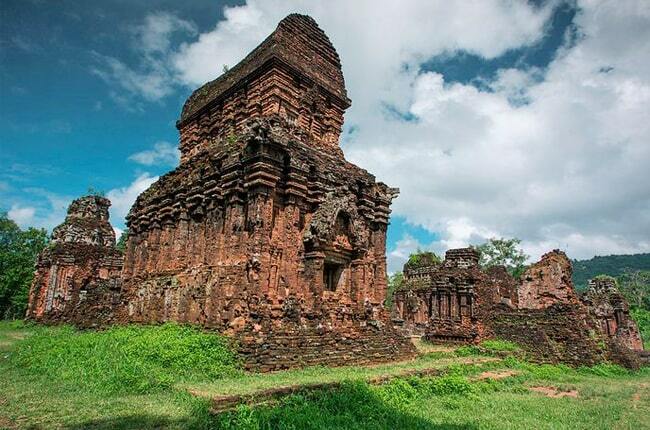 The My Son temple complex is considered one of the most important Hindu temple complexes in Southeast Asia and is the most important legacy of its kind in Vietnam. It is often compared with other historical temple complexes in Southeast Asia, such as Borobudur in Java in Indonesia, Angkor Wat in Cambodia, Bagan in Myanmar and Ayutthaya in Thailand. The temples and tombs, which can be found at My Son are being dated to the period between the 4th century and the 14th century AD. However, it appears from inscriptions and that there were earlier structures (temples) at this place. Unfortunately, they all have gone. Description of the main buildings. The complex is divided by letters: A, B, C and so on. They have not yet explored the whole complex. Archaeologists consider Group B as the epicentre of My Son. They are in the descriptions marked with the letter B. The main Kalan (sanctuary), B1, was devoted to Bhadresvara, which is a contraction of the name of King Bhadravarman, who built the first temple in My Son, combined with '-esvara "which means Shiva. The first building on this site was built in the 4th century, but was destroyed in the 6th century and rebuilt in the 7th century. Only the 11th century base, made of large sandstone blocks, is still standing. The niches in the walls were used for hanging lamps (Cham shrines had no windows). The linga (a phallic symbol) was unearthed in 1985, one meter below its current position. B5, was built in the 10th century and was used to store sacred books and objects that were used for ceremonies, which were performed in the B1. The boat-shaped roof has Malayo-Polynesian architectural influences. Unlike other sanctuaries, this building has windows and the Cham masonry on the inside is original. Above the window on the outside is a brick bas-relief of two elephants under a tree with two birds in it. The ornamentation on the exterior walls of B4 is an excellent example of a Cham decorative style. This is typical for the 9th century and it is said to resemble worms. The style is unlike that in other Southeast Asian cultures.